In order to use the Meeting Room App, you will need to provide the web address of a calendar in iCal format. In this tutorial, we go through the quick and easy steps of exporting your Google Calendar in iCal format. In your Google Calendar, look on the left sidebar below the little monthly calendar for the calendar you want to export. There are "my calendars" and "other calendars". On the right of the selected calendar, three dots will appear when you hover over it. Click on these three dots and then select “Settings and sharing”. On the loaded page, scroll down till you reach the section "Integrate calendar". There are two boxes, "Public address in iCal format" or "Secret address in iCal format". Which one you choose depends on whether it is a public or private calendar you are sharing. Copy the address. 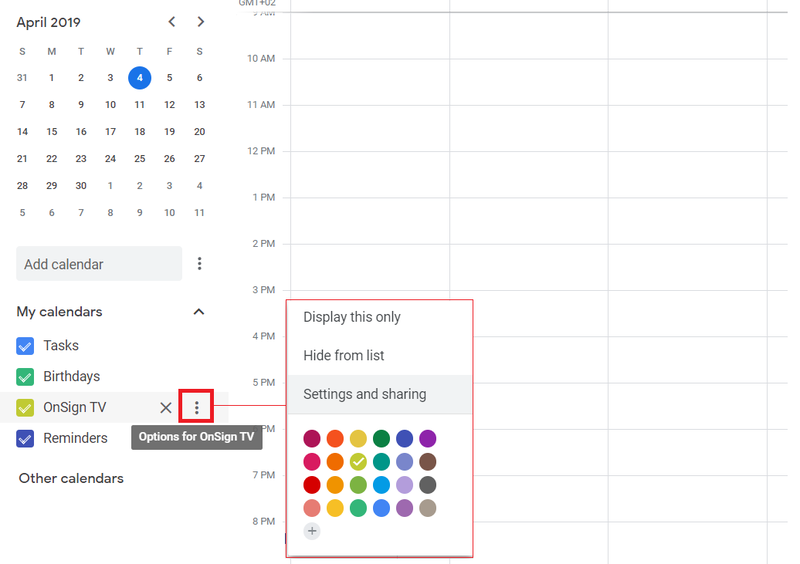 This is the URL you need to provide to OnSign TV in order to synchronize the calendar content and add to your displays.